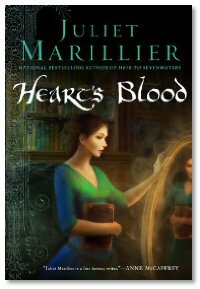 It’s always fun to discover a new author and that's what Heart's Blood has done for me; helped me to discover Juliet Marillier. Now, Ms. Marillier is no new author you understand, she's simply an author I haven't read before. And frankly, if this book wasn't in a stack of review books I received, I wouldn't be reading her now. It's not that I haven't seen her books on the shelves before, and even picked them up. But the combination of cover art and cover blurbs, always seemed to paint her books as Marion Zimmer Bradley Avalon knock-offs. However, Heart's Blood isn't a copy-cat story and is entirely worthwhile reading on its' own merits. I’m just not sure that her marketing shows that she has her own stories to tell. Anyway, back to Heart's Blood. Set in Ireland around the time of the Norman invasion, Caitrin is running away from home after her father's sudden death. She finds refuge in the crumbling and spooky fortress of Whistling Tor. I'm not sure if the book is meant to be set in our history or if it is an alternate history. But it really doesn't matter. The book serves up mystery, a little horror, and some Gothic Romance flavoured with the story of "Beauty and the Beast". In Heart's Blood Ms. Marillier has created believable characters, both living and dead who grow and change through the book. Far from being a knock-off, the story and style stand out nicely on their own. I'm glad to have had the opportunity to discover her work.